There is always something to be learned through tea. Sometimes I get overwhelmed with the amount of knowledge tea experts have, and I wonder if I'll ever have a tiny sliver of their expertise. In order to learn as much as possible, I'm always on the lookout for tea books and publications to read, and I recently came across information on Tea Journey, an upcoming multi-media digital magazine for anyone interested in all things tea. You can view an informative video about the publication here. There will be three 150-page journals each year. I looked at a prototype, and loved every article I read. The articles are well written, informative and you can feel the writer's passion for the subject. I'm certainly not the type of person that would shamelessly promote just any old thing, I really enjoyed reading the magazine and look forward to more. The mobile journal is led by Dan Bolton, a seasoned veteran of the tea and publishing world. He has taken years to carefully select writers for the magazine, and I honestly think the time and effort shows through the magazine's pages. The magazine has set up a Kickstarter campaign that starts April 3rd. There are different levels you can contribute to, whether you would like to just take a peek at the publication, become a subscriber, or be a more dedicated investor. I'm not one to back any old kickstarter, in fact I think about it for way longer than necessary. So you should have a look and decide for yourself. Through the articles you can expand your tea knowedge with beautifully written stories and stunning images. 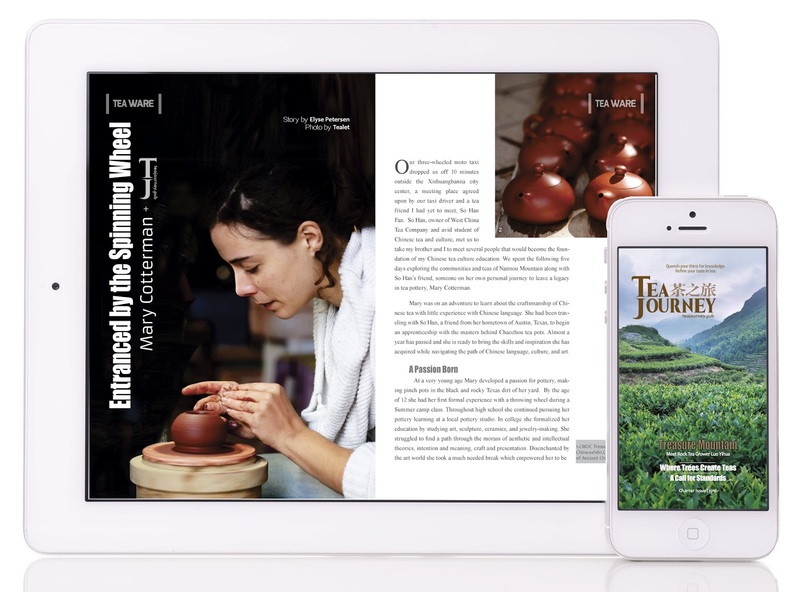 The publication covers all things tea, from interviews with growers, processing, terroir, tea ware, etc. A glimpse into the first edition shows an interesting article about what it's like to be a passionate tea grower in wuyi, a look into a unique Japanese tea garden, a fascinating article about a teaware artisan, and a large amount of other useful information and steeping notes. I look forward to learning more about Tea Journey, and hope to discuss the articles with everyone! Nice of you to share this latest kicks-tarter magazine Tea Journey; I recognized noted tea figure James Norwood-Pratt; where I live when I walk downtown there is a Norwood insurance place adjacent to where we bank; so at times I am reminded of that name in two different ways; as a city in Massachusetts and as the last name of a famed tea person. Again, lovely news Sarah. Long may Tea Happiness thrive. I am also amazed with those people who has great knowledge about tea. I read a blog about tea, where in it significantly discuss the importance of the mountain height of where tea being farmed.